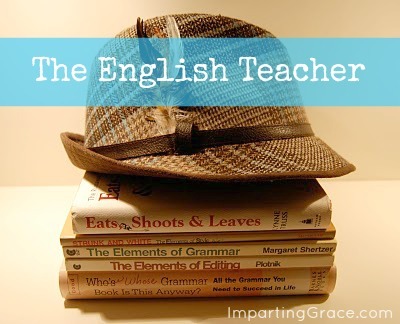 It's Thursday, and it's time for another installment in my English teacher series. Click on any of these to go directly to that lesson. Last week I asked readers to ask questions and to suggest subjects for these posts. I really want to address grammatical issues that are interesting to y'all. Thank you all for commenting. Several commenters said that they like to use a conversational tone in their blogs, so sometimes they use incorrect grammar on purpose. I do that, too. I think it's perfectly acceptable to write blog posts conversationally, and sometimes that will mean that we break the rules of formal grammar. For example, I often include sentence fragments in my blog posts. Those would earn big red marks on an English paper, but blog posts are not English papers. So I certainly encourage you not to think in terms of trying to achieve grammatical perfection. That's not the goal, not by any stretch of the imagination. I can't say this enough: the goal is communication, and grammar is simply a tool to help us communicate. 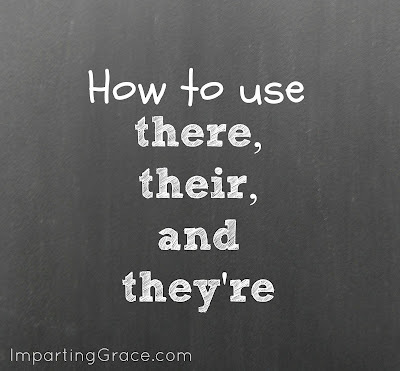 Today, we'll look at an issue suggested by one of last week's commenters: the use of there and their. And for good measure, we'll throw in they're as well. Once again, this is an issue that exists only in written communication, not in spoken communication. 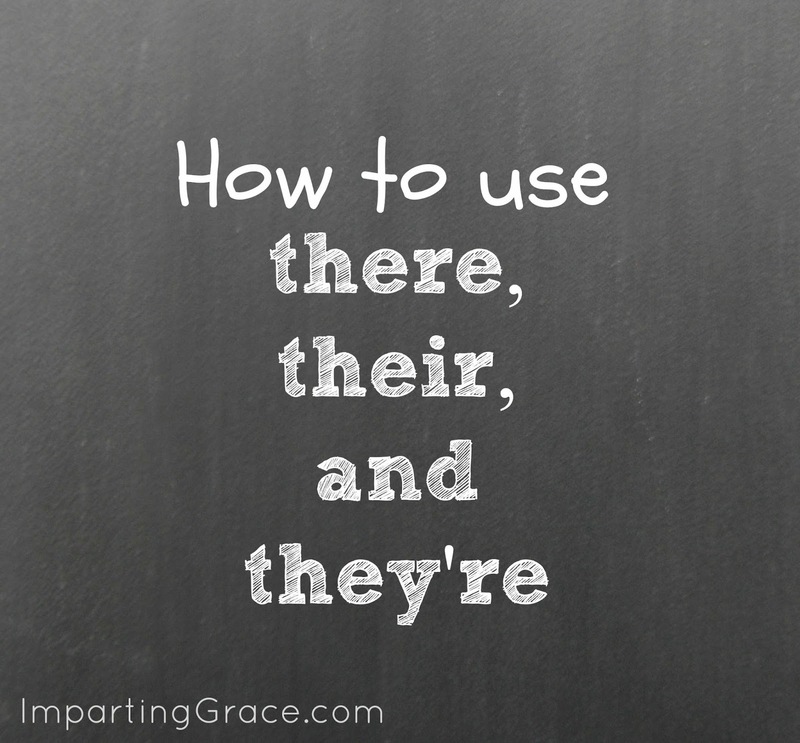 There, their, and they're sound alike, so if you're speaking, no one will know if you're using the correct form. Your listeners will hear the correct word. But if you're writing, it's up to you to choose the correct word. Here's the scoop on these three words. Hang your backpacks over there. Give your money to that woman there. There! I'm so glad that's over! A good way to remember whether there is the word you want is see if you can mentally replace it with the word here. The words here and there have different meanings, but they're grammatically interchangeable. This is easy to remember, because you can see the word here right inside the word there. Sometimes you'll use the word there in combination with the verb is. The contraction of those two words is there's. Use this word only when you mean to say there is. Their house is at the end of the street. Would you mow their lawn while they're out of town? They're really using their heads. The property is rightfully theirs. But remember, apostrophes are used to form the possessive form of nouns, not of personal pronouns. So if you see the word their's, you'll know it's wrong. And the last word in this troublesome trio: they're. They're is simply a contraction of the two words they and are. They're so happy to be home! Did you know they're leaving? Use the word they're only when you could replace it with the two words they are. Thank you to Jennifer Juniper for suggesting a lesson on what she called "the there/their circus." Jennifer was Commenter #9 last week, and she's the winner of the giveaway. Jennifer, send me an email with your mailing address, and I'll send your bookmark to you right away! Please let me know if you have any questions you'd like me to answer in this series. I want this series to be helpful, so please tell me if there's any way it could be more beneficial to you. And thanks for reading! I'm so happy to have you here! 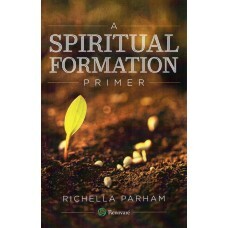 Great series, Richella! You are so clear and encouraging. My favorite thing I learned all through school came in an early English lesson: "There is an exception to every rule." That's how I hope I live my life, too! One of the things I see on a number of blogs is a misuse of THEN and THAN... it is like fingernails on a chalkboard to me!!! So that could be a possible future topic for you. Blessings!!! Thanks teach! I love this series. I would like to know your view on using 'because' to start a sentence. My children are going through a writing program that encourages this. The program states that it is not improper, but was started as a way to keep younger children from writing in incomplete sentences. It is hard for me to see my children begin sentences (in formal writing, of course) with 'because." Thanks Richella - I have greatly enjoyed your weekly lessons. Great lesson, Richella! I think what you're doing is great in getting people more adept to the art of grammar. I've got a good one: how about the ways you do and do not use prepositions! Ah, I feel so civilized when I come over here for my grammar lesson - it almost makes me want to drink some tea with my pinky out! I want to know if you'll be awarding diplomas at the end of this series. Oh wise one..I love you. I sometimes think I live in the land of bad grammar where words like "boughten" as "I boughten it at the store" (I'm not even sure how to spell it LOL) are used everyday by all kinds of people. I think it's a southern thing!